When you are logged in, at top of the page appears the topbar and over every content appears an edit bar. If the edit bars bother you, you can disable them clicking on TOGGLE EDIT BARS. 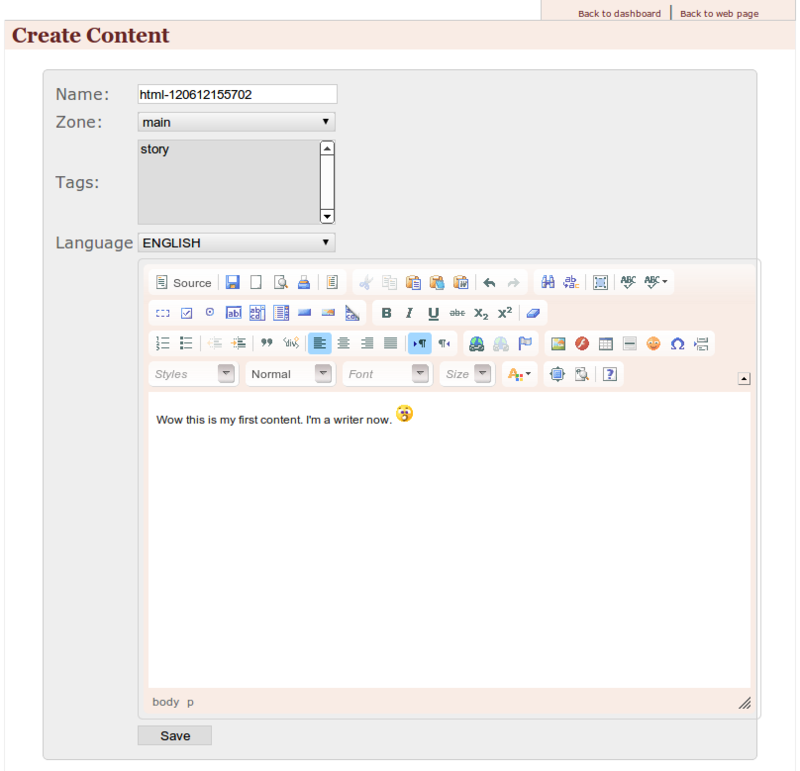 The easiest way to add a custom content to the page is the html slice. Click on ADD SLICE in the top bar, and then on HTML. save it and take a look to the web page. The content is there. Simple, isn’t it? Editing a content is as simple as inserting a new one, just click the edit button in the edit bar over the content you want to modify. As you can see, is now appeared the versions box. What the hell is that? Well, it’s one of the most powerful features of ACRCms: every time you edit a content, the previous version remains stored in the database and you can roll it back whenever you want. Ok, so, click on edit in the versions and translations box, edit a content and then save it. And, then try to click on revert on a previous version. It’s magic™. Add an image slice (ADD SLICE -> IMAGE). The box that appears is the ACRCms asset chooser. 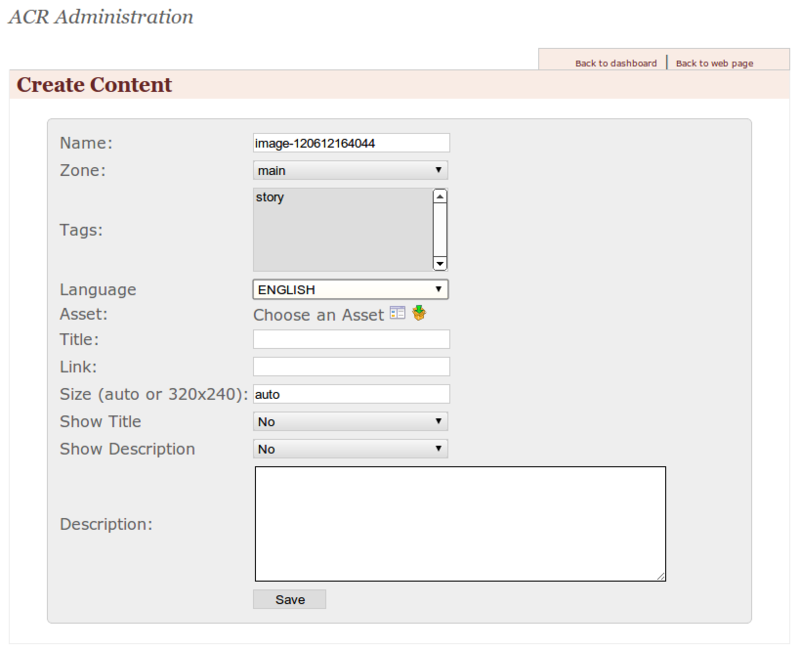 the usage is pretty simple, just select an already uploaded asset from the assets browser, or upload a new image, return to the asset chooser and select it. Fill the title field, insert a web link if want to open a new web page on image click, insert a specific dimension (auto will preserve the actual image size) and provide a description (facoltative). Save the slice, and your image is displayed on the bottom of the page. then click on Disqus icon (general setting panel). Insert the website name in the User ID field and click change. Now return back to your site page, click on ADD SLICE -> DISQUS THREAD, don’t change any field and click save. Ok you have your comments thread. When your site has grown up, you need a new page to accomodate your contents. It’s a trivial task: click on ADMIN -> CREATE PAGE. For this tutorial, we are going to select ------------, insert test as title and url and save. You will be redirected to the newly created page and a new menu entry for that page is automagically added on the top menu. Almost any content-centric website needs a search bar. In ACRCms is simple to add one, click on ADD SLICE -> SEARCH, save and the search bar will be placed in your page. Save it and you have a breadcrumb bar. For details please read Genshi Slice Reference.